I always have a little chuckle with myself when trying to come up with names for my dishes. (I work alone so I don't have the option of sharing my hilarious ramblings with anyone else) You see, the one pictured above is: 'a balsamic and smoked paprika pork fillet casserole with tomato and red peppers' but that just sounds ridiculous, I might as well copy and paste the ingredients list or call it 'pork fillet with 9 other things'. You have to sum it up in a way that explains the dish, like naming a child in a way, as you want its name to represent all of its characteristics - but realistically if I called it 'Andrea' people would be right to want to put me in the loony bin*.You want something simple, but not as unappealing as 'tomato pork' or 'pork thing'. So you have another cup of coffee and sigh a bit more and come up with: 'Balsamic and tomato pork casserole' (personally I think 'Andrea' sounds better). It's delicious (although I tend to say everything I make is delicious, I hope I am not starting to sound vein, if I am, I apologize) But you must take my word for it and make it with the Butter Bean Mash as an accompaniment - it knocks the socks off normal mash and takes 2 minutes - literally 2 minutes - to make. Put a non-stick pan on high heat. 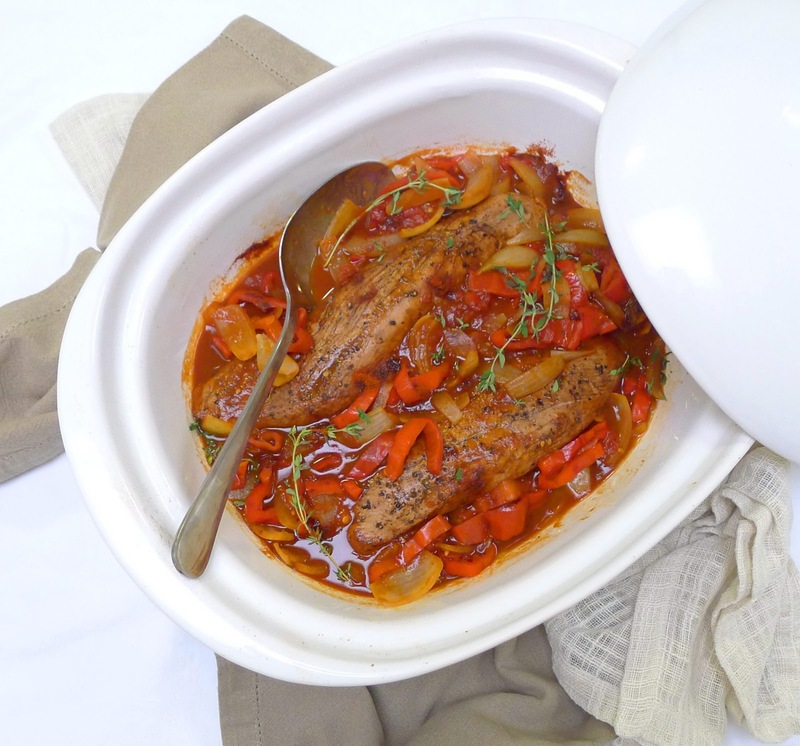 Put the pork fillets into a med/large casserole dish and set aside. Using the same pan, add a little olive oil and then the onions, peppers and a little salt and fry for about 8 minutes, tossing continuously, until slightly caramelised and softened. Add the tinned tomatoes, stock, sugar and balsamic and simmer to reduce for a further 10 minutes. Pour on top of the pork fillets, sprinkle over the thyme and smoked paprika and cover with a lid/foil. Bake in the oven for 20-25 minutes*. Remove and allow to rest for 5 minutes before serving. *To tell if the pork is cooked through, simply press different areas of the fillet gently with your index finger, all areas should feel the same i.e. slightly firm - if the centre of the fillet is much softer than the ends then it needs a few more minutes in the oven. Place a small sauce pan on medium heat and pour in the butter beans, olive oil, lemon juice, garlic and a little salt and pepper. Mash as you heat the mixture for 2-3 minutes, then cover and set aside. I love Andrea too! It would seem we have been craving similar foods lately! 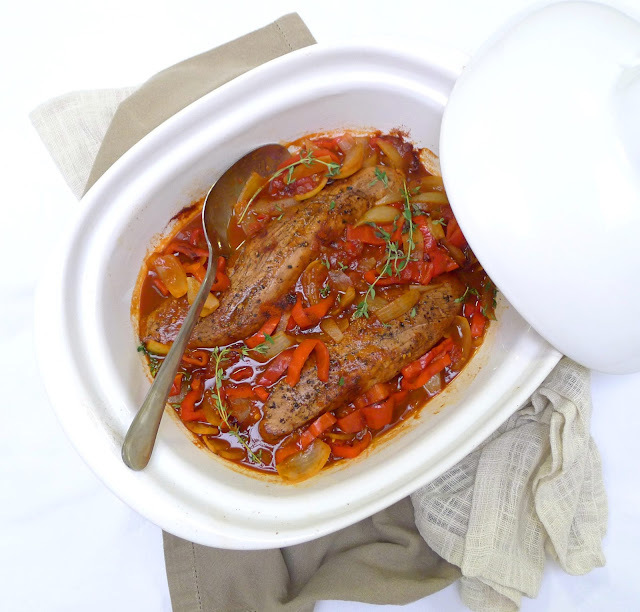 I posted a fish dish with a tomato and red pepper sauce today too! Is this a 'great minds' or "fool never" moment ... nahhhh, just good taste buddies! Love this idea my angel and I must admit butter bean mash is an ABSOLUTE FAVE of mine! too! Butter bean mash for life - guess what I spent all my Rhodes vouchers on teehee!